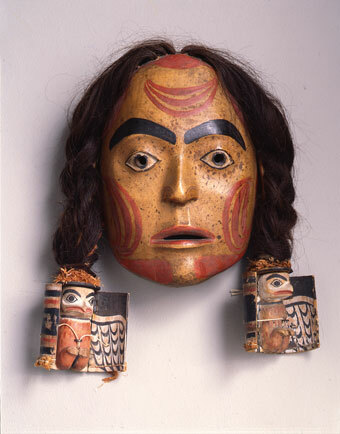 Unknown Nisga’a artist, Mask, ca. 1860, human hair, paint, cedar bark, and wood, Museum Purchase: Helen Thurston Ayer Fund, no known copyright restrictions, 46.14. The Museum’s collection of Native American art is housed in the Confederated Tribes of Grand Ronde Center for Native American Art. The collection, remarkable for both its depth and diversity, consists of more than 5,000 prehistoric and historic objects created by some 200 cultural groups from throughout North America. Included are outstanding works by Native American masters such as Allan Houser, Charles Edenshaw, and Maria Martinez, in addition to regional contemporary artists such as Lillian Pitt, Joe Feddersen, Pat Courtney Gold, Rick Bartow, and James Lavadour. 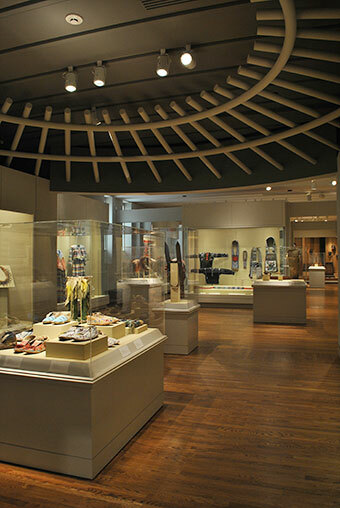 The Center is located on the second and third floors of the Hoffman Wing in the Museum’s Main Building; each gallery is devoted to art from a specific cultural region. The second-floor galleries focus on the Museum’s world-renowned collection of Northwest Coast art as well as galleries dedicated to the Arctic, Plains, Woodlands, Southwest, and California regions. Also located on the second floor is the Phil and Sue Bogue Gallery, dedicated to the display of the Museum’s excellent collection of Pre-Columbian art from Meso and South America. Two additional galleries featuring work from our own region, western Oregon and the Columbia Plateau, are located on the third floor. The majority of the Museum’s collection of Native American art comes from two sources. In 1948, the Museum purchased Axel Rasmussen’s collection of Northwest Coast art, and in 1986, Elizabeth Cole Butler began donating her encyclopedic collection of Native American art of North America. The Center is named in honor of the Confederated Tribes of Grand Ronde and the Spirit Mountain Community Fund and is dedicated to all the Native American tribes of Oregon.